Dec. 11 (Bloomberg) — Greece and Ireland are among countries in an “intolerable” economic situation, which may lead to bailouts or even an exit from the euro area by the end of next year, according to Standard Bank Plc. The absence of a mechanism to permit so-called fiscal transfers within the 16-nation region may undermine the exchange-rate system, said Steve Barrow, head of Group of 10 foreign-exchange strategy at the bank in London. Concern some nations will need to be rescued may drive the premium investors demand to hold 10-year Greek debt instead of benchmark German bunds to 400 basis points next year, from 214 basis points today, he said. The Irish premium may also jump, he said. The Irish Finance Ministry called the suggestion it might leave the euro area “uninformed comment,” and Greece said there was no chance it would leave. The widening difference in yield, or spread, between Greek and Irish bonds and German securities may accelerate, increasing the debt burden for these countries, he wrote in a report today. The Irish-German 10-year spread may rise to 300 basis points next year, from about 170 basis points, he said. The spread averaged about 43 basis points in the past five years, with the Greek-German average at 67 basis points in the period. “It can, in many ways, be a more destructive line of attack for the market than currency pressure,” Barrow wrote. Greek yields soared this week after a cut in the country’s credit by Fitch Ratings, which said Prime Minister George Papandreou’s government doesn’t grasp the debt crisis’ severity. 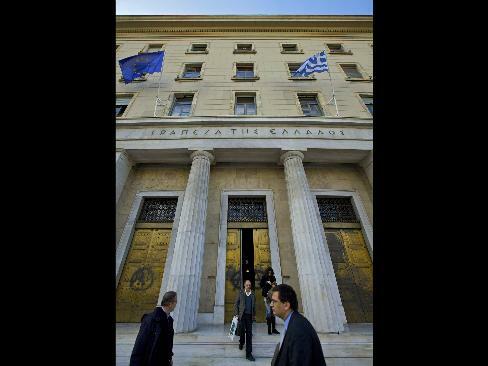 Standard & Poor’s signaled it may also reduce Greece’s ranking. The spread with bunds reached 251 basis points yesterday, the widest since April 2. Yields on two-year Greek government notes jumped 66 basis points on Dec. 8, the most since 1998, after Fitch cut the rating to BBB+, the lowest level of any of the countries sharing the euro. Greek Prime Minister George Papandreou said that European Central Bank President Jean-Claude Trichet and Luxembourg Prime Minister Jean-Claude Juncker see “no possibility” of a Greek default. “There is no possibility of a default for Greece,” Papandreou told reporters at a European Union summit in Brussels. He also said there was no possibility of Greece leaving the euro area.